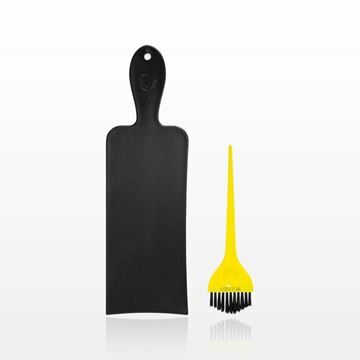 Apply color with ease by using this professional balayage board and brush set by Colortrak™. This balayage board is slightly curved on two sides to better suit the client’s head shape and also has one textured side and one smooth side for versatility. The board handle allows for comfort and stability. Included in this set is a Dimensional Balayage Brush, which is designed with ultra-soft, peaked feather bristles for line diffusion and blending.